The year 2014 marks the Centenary of the outbreak of World War I when, on August 4th, Britain declared war on Germany following the invasion of Belgium and France by German forces. The Germans quickly advanced across Belgium towards the channel coast, occupying much of the country until their advance was stopped east of the medieval town of Ieper (also known as Ypres) in an area that became known as the Ypres Salient. The Salient, where the armies of the British Empire, France and Belgium held a bulge in the German occupied territory, was the location of no fewer than five major but all unsuccessful German offensives between 1914 and 1918. Had they succeeded in the capture of Ypres, a strategic road junction, the movement and supply of British and Empire forces from the channel ports to the western front would have been severely compromised or cut off altogether, possibly altering the outcome of WWI. 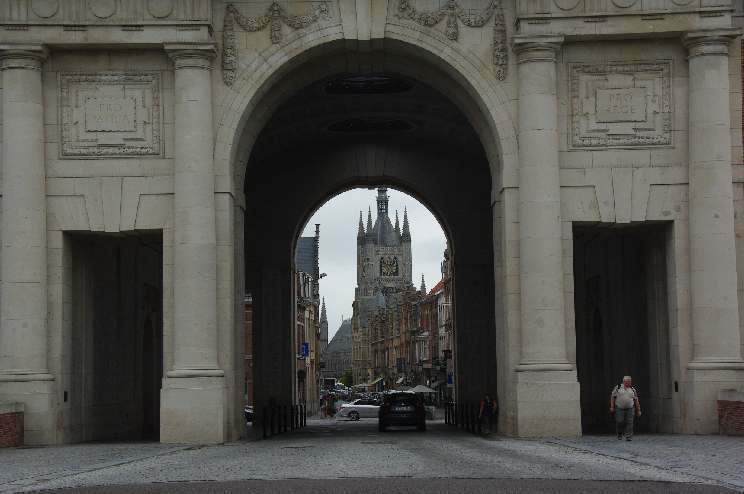 Ieper became symbolic as the last major Belgium town not to fall into German hands. During the course of the war, British and Empire troops would pass through Ypres on their way to battle. 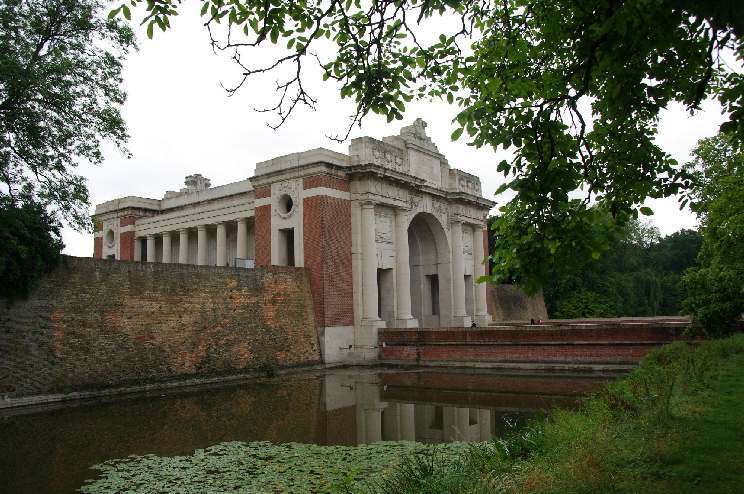 They would leave the town via the Menin Gate, located on the medieval eastern town wall, cross the moat and travel along the road towards the town of Menin and battlefields of the salient. In the four years of war, some 204,000 British and Empire soldiers died on the battlefields of Belgium with an estimated 185,000 of these falling in the area of the salient. Many were buried on the battlefields in small makeshift cemeteries near where they fell but close to 100,000 of those lost still have no known grave. 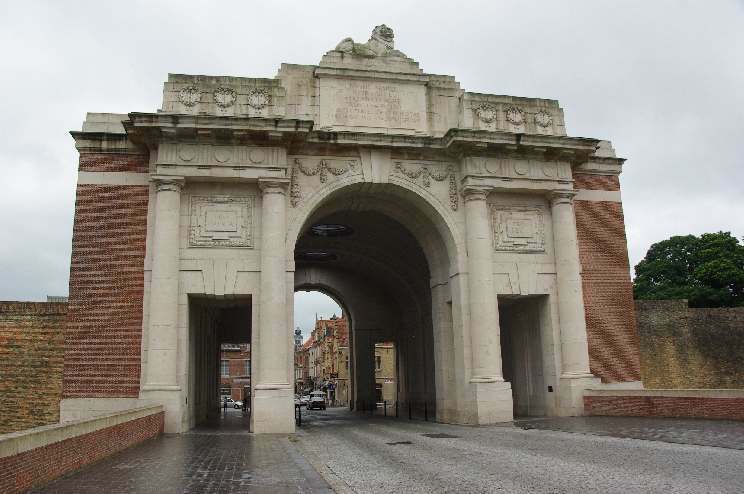 Several years after the Armistice of 11 November 1918, it was decided to rebuild the Menin Gate as a lasting memorial to the British and Empire forces who had held the German advance at the town of Ieper. 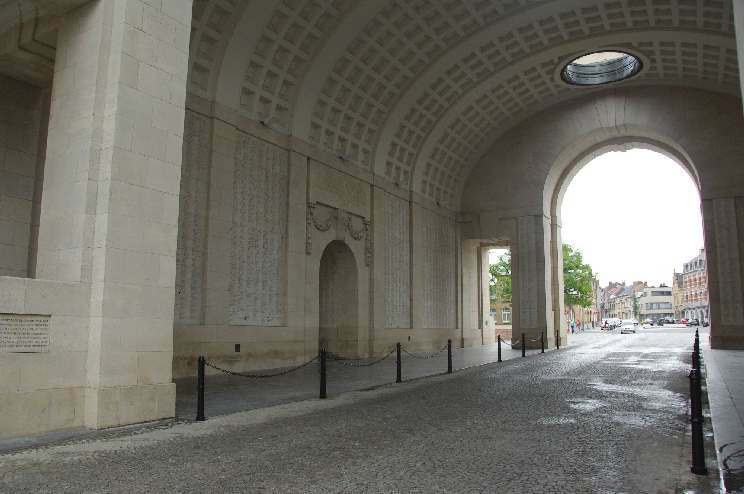 This new Menin Gate was constructed by initiative of the Empire War Graves Commission (later the Commonwealth War Graves Commission) as the Menin Gate Memorial To The Missing. 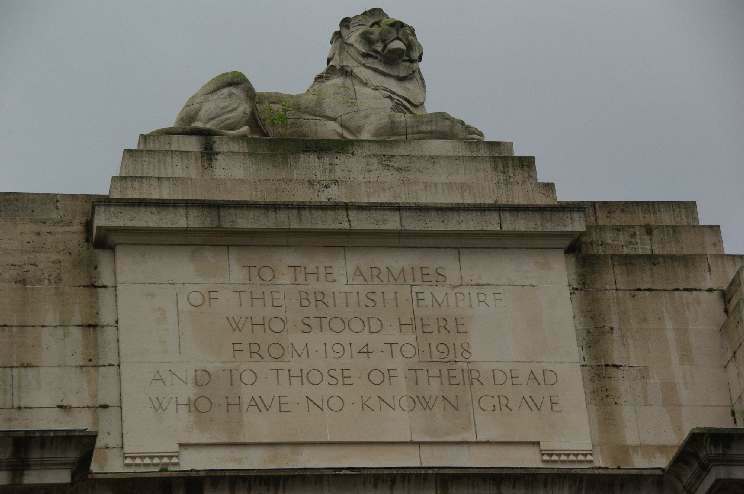 The inscription above the gate archways read “To the armies of the British Empire who stood here from 1914 to 1918 and to those of their dead who have no known grave”. The plaque was unveiled and the Menin Gate Memorial To The Missing officially dedicated on 24 July 1927 by Field Marshall Lord Plumer. Listed on the wall panels are the names of some 54,389 British and Commonwealth servicemen (excluding those from New Zealand and Newfoundland who are honoured elsewhere) lost prior to 16 August 1917. A further 35,000 names of those who fell after that date are listed on the Tyne Cot Memorial to the Missing at nearby Passchendaele, also in Belgium. 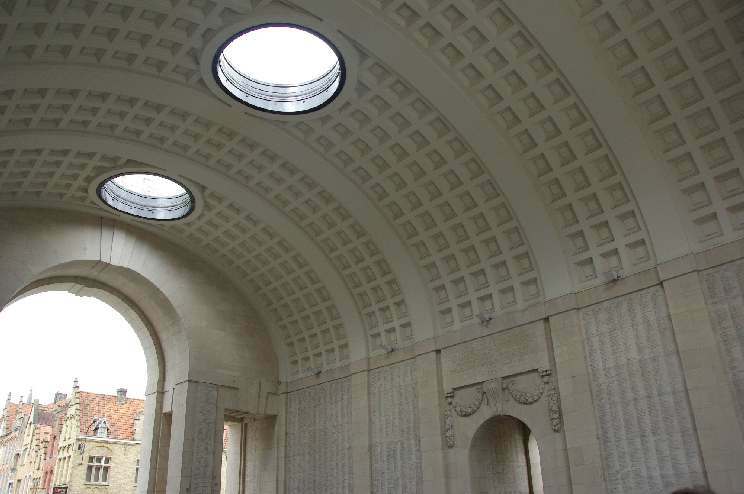 Inside the Menin Gate Memorial. 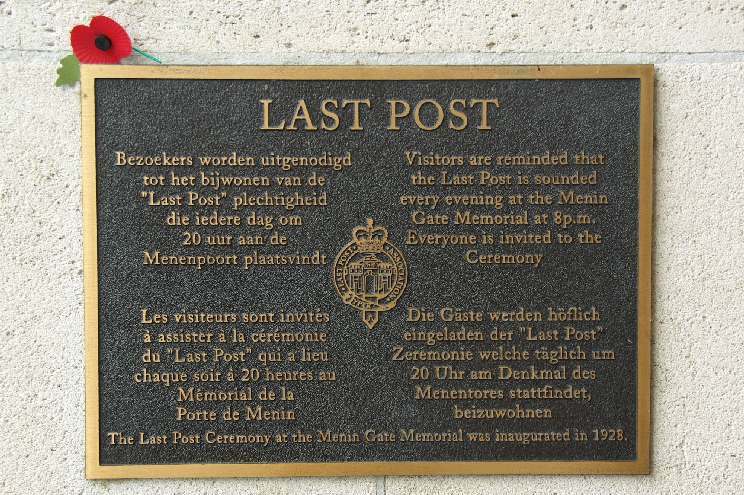 Commencing in 1927 shortly after the unveiling, the townsfolk of Ieper have held the Last Post Ceremony at 8pm each evening under the Menin Gate, except during the German occupation of WWII. The town Mayor or his representative will lead the ceremony followed by the laying of wreaths by a member of the Belgian armed forces and the Last Post played by volunteers from the Ieper fire department. 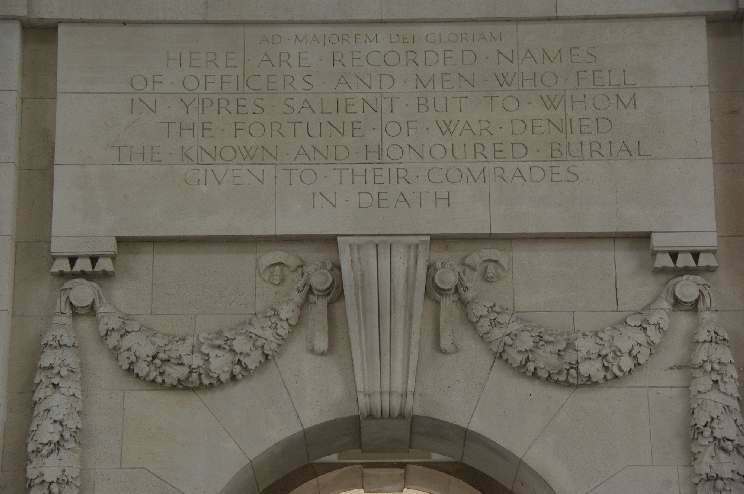 "Here are recorded names of officers and men who fell in Ypres Salient but to whom the fortune of war denied the known and honoured burial given to their comrades in death".